CREDITS: Bally's Atlantic City, Symphony Orchestra of Arlington & many more! Enter a world where nothing is impossible and the seemingly ordinary becomes the incredible. Experience ORIGINAL ILLUSIONS "Dinner", "The Sorcerer's Apprentice", "The Rites of Spring", "Through the Looking Glass" & "Floating Butterflies" along with other intriguing and astonishing performance pieces. Including engaging classics of magic, amazing feats of mentalism plus a few surprises. The performance is all about creating an amazing entertainment expereince for you and your guests, clients, friends and family members. Over 12 year professional performing expereince, study, heart and intense training go into crafting your special event performance. Parlor Magic- Dynamic entertainment in a sophisticated atmosphere. Parlor Magic allows for enchanting illusions in an intimate setting. Original illusions, "classics" of magic, interactive presentation, audience participation and a good time for all is the order for Parlor Magic. Recommended for Adult Birthdays, intimate gatherings and events where a unique, entertaining presence is desired. Stage (or Platform) Magic - Similar to Drawing Room Magic, usually on a stage or raised platform and of a slightly broader performance scope (Can include Houdini's Metamorphosis, Strait Jacket Escape, The Amazing Prediction and other large illusions). Stage Magic can be incorporated into many venues and is recommended for larger parties, events and banquets. Mentalism - "Shades of Perception" is the newest Illusions by Vick show available for you and your guests entertainment, amazement and enlightenment. In "Shades of Perception" Illusions by Vick acknowledges Mentalism isn't about "mind reading" as the mind is not a book to be opened and read, instead the mind has varying shades of perception, thought, feelings, emotions and many attributes that are not yet fully understood. In this new show Illusions by Vick focuses on the audience, searching for and illuminating their powers and abilities which they may not have been aware they possess! Mobile Station Performance - Innovative alternative to strolling (or walk around) magic that encourages guests to enjoy magic at their leisure while adding to the elegance, intrigue and festivity of your event. Recommended for receptions, large parties where the event is taking place in various areas or venues where there will be more than one performance or act performing simultaneously. Please contact Illusions By Vick for details about this uncommon performance style. Corporate Events - Reward your company with an unforgettable experience. From recognizing top performers in your organization to a one of a kind team building experience. Special Holiday performances help make your Holiday Celebration even more magical. Illusions by Vick works with your H.R. staff and/or party organizer to create a unique entertainment experience specially tailored for your company, staff and families and your event. Trade Shows - Ready to have the busiest booth at the show?! Illusions By Vick promotes your company and company message in memorable fashion while attracting more attendees and increasing your show presence! Create a buzz on the show floor about your company. Clients will remember your message and talk about your companies, services and goods long after the performance. School and Library Shows - Entertain students, teachers, staff, patrons and faculty with a program designed for your school and event. We encourage everyone to read more often. Fund Raisers - Fund Raising events with a program tailored to reach your specific goals financially while promoting core values. Illusions by Vick works with you to promote the show through providing advertising materials, doing pre-show work and applies experience from previously performing successful fund raisers. Everyone has an outstanding evening out, is entertained and amazed while supporting your worthwhile cause. Sharing something amazing today and helping create great memories that last a lifetime. out of over 300 acts they represent! 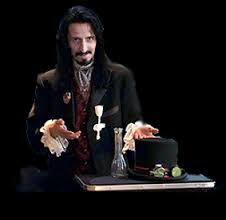 Professor Snape from the Harry Potter stories, Venetian Masquerade Entertainer, an Illusionist circa 1900, wandering conjurer, The Mad Hatter, a wizard, pirate, con man, Edgar Allen Poe, Captain Hook and Willie Wonka. "Sometimes I've believed as many as six impossible things before breakfast "